The cabin accurately reproduces in 1:1 scale the cockpit of the Airbus A320. Virtual reality is given by a 220 ° panoramic screen, ensuring total immersive immersion further enhanced by full HD. A system of transducers using electric motors guarantees real effects of vibrations in taxiing, takeoff and landing giving you the feeling of being in flight. Along with breathtaking views with detailed scenarios of airports and photo realistic landscapes. ​ The instrumentation allows the use of the normal flight operations of the A320 such as flight planning and performance through the MCDU (Multifunction Control Display Unit) and FCU (Flight Control Unit), as well as simulating the most common ECAM procedures. You can also program the most common failures (Engine Out, Engine Fire, etc). The user can decide by starting an IFR flight session from a "cold and dark" situation from an airport with the possibility to choose the real or customized weather. 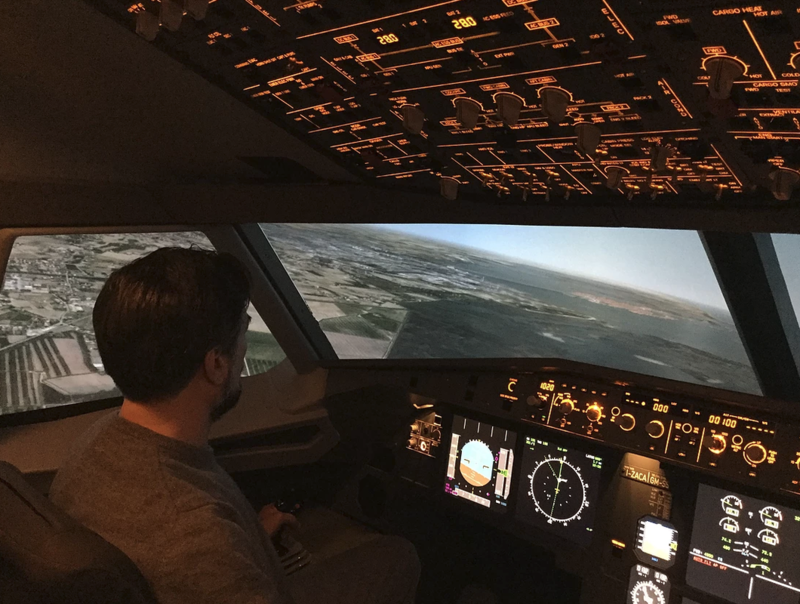 ​The simulator is aimed primarily at pilots and students who need to learn and refine the use of IFR procedures, replicate failures, and review flight procedures for exams or assessments. The Airbus A320 family of aircraft is a single-aisle, medium and short-range 150-seat passenger aircraft developed and manufactured by the European Airbus Industry Company . It is the first commercial aircraft to use digital telemetry to operate the flight control system, and it is also the first civil aviation passenger plane to relax its static stability design. The A320 family of aircraft is designed to improve cabin adaptability and comfort. The A320 family of aircraft, including the A318, A319, A320, and the A321 comprise a series of single-aisle aircraft . It is designed to meet the needs of airlines for low-cost operation of short-haul routes and provides operators with the greatest commonality and economy among 100 to 220-seat aircraft. Since the A320 aircraft was put into operation in April 1988, it has quickly established an industry standard of comfort and economy on medium and short-haul routes. The success of the A320 series also established Airbus’ position in the civil aviation passenger aircraft market, breaking the monopoly of the U.S. passenger aircraft market, and developing models that compete with the Boeing 737 series and the McDonnell Douglas MD-80 series. The Volarent Airbus A320 flight simulator is a high-level flight training device developed with imitation technology for the Airbus A320 model and based on the CCAR-60/FAR-PART-60 standard. It uses advanced flight control software and graphics, Image systems, and electromechanical integration systems combined with professional aviation training knowledge to develop a high-precision flight simulation of Airbus A320 aircraft. The Volarent Simulator is an indispensable part of flight simulation training. It is one of the necessary equipment for training of civil aviation pilots. The equipment helps pilots to perform many repetitive instrument training exercises, failures, or emergencies. ​​Lockheed Martin released Prepar3D in 2010. Since then, Prepar3D has been leading the way for the future of flight simulation software with advancements in nearly every conceivable aspect of the system. 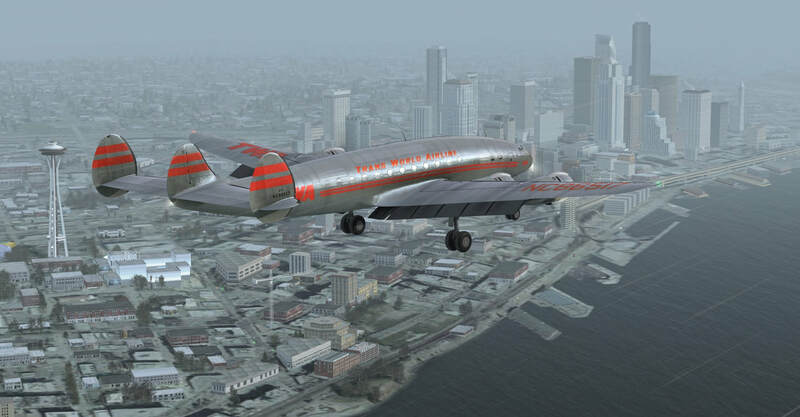 P3D in many ways picked up the baton left by Microsoft Flight Simulators when they launched their last release in 2006. 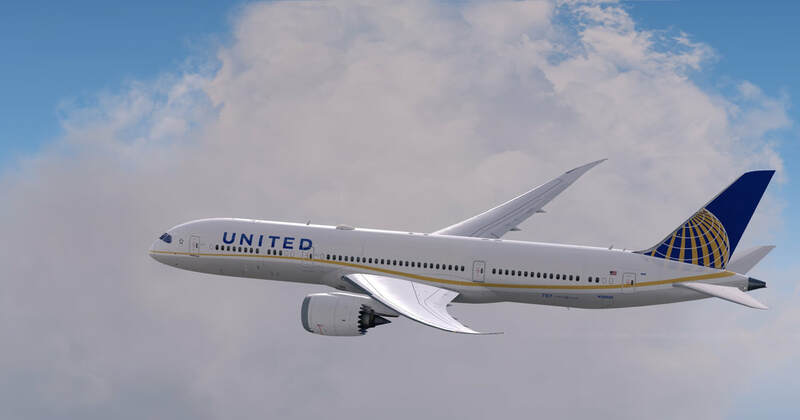 It improves upon the rudimentary FSX flight concepts, and it improves upon many features while still being very similar to FSX in terms of usability and the learning curve between the two software releases. Prepar3D has quickly risen to become one of the top three simulators on the VATSIM network, and is used by many in the aviation field for training and online. Part of this is that it is very customizable and can work according to your needs. This software gives flight schools the most freedom in terms of software that fits their exact requirements for training. Prepar3D also allows for virtually infinite add-ons, allowing the user to constantly change and adapt the environment as their needs shift. This software is installed when your simulator is being set up, and allows you to begin working, flying, and training immediately after being setup by our team of specialists. There is also an exhaustive resource of free and paid scenery available for download online, as well as many add-ons designed by professionals and individuals to improve the way your simulator functions. The sounds for the aircraft, world, and ATC in P3D are also top quality, with many sound pack add-ons available to improve it even further. The starter graphics look very refined also, but many add-ons such as additional sun glare and cloud enhancements further increase the experience. P3D is continuing to lead the way in the aviation industry as a preferred choice for training. Given the success, P3D was the perfect choice as a software for our simulators. Many people in the simulation community and flight school community alike prefer this software above all competitors. P3D is standard on all of our simulators, and we are proud to bring you the latest in training technology advancements.